HomePage > News > Dim sum restaurant by Linehouse is "British tea hall turned Chinese canteen"
Dim sum restaurant by Linehouse is "British tea hall turned Chinese canteen"
Linehouse's contemporary Hong Kong restaurant takes its cue from the life of cross-cultural pioneer John Anthony and references a retro, east London Chinese canteen. Designed by Shanghai and Hong Kong-based architecture and design studio Linehouse, the restaurant is named after John Anthony, the first Chinese-born man to be naturalised as a British citizen, in 1805. Anthony worked for the East India Company at Limehouse in London's east end, where his job was to provide food and lodging to arriving Chinese sailors. 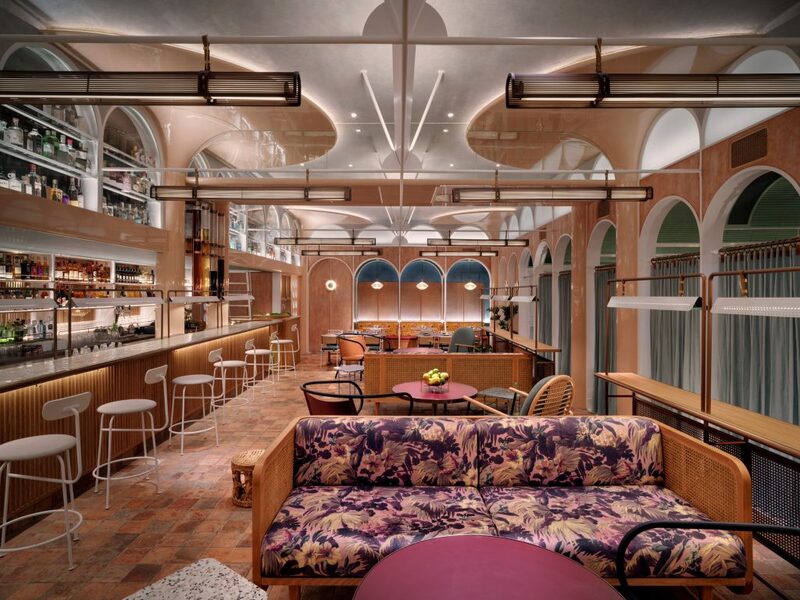 "The design drew on John Anthony's journey, exploring the fusion of architectural styles and materiality between east and west as well as colonial architecture blurred with eastern detailing, to create a British tea hall turned Chinese canteen," said Linehouse co-founder Alex Mok. 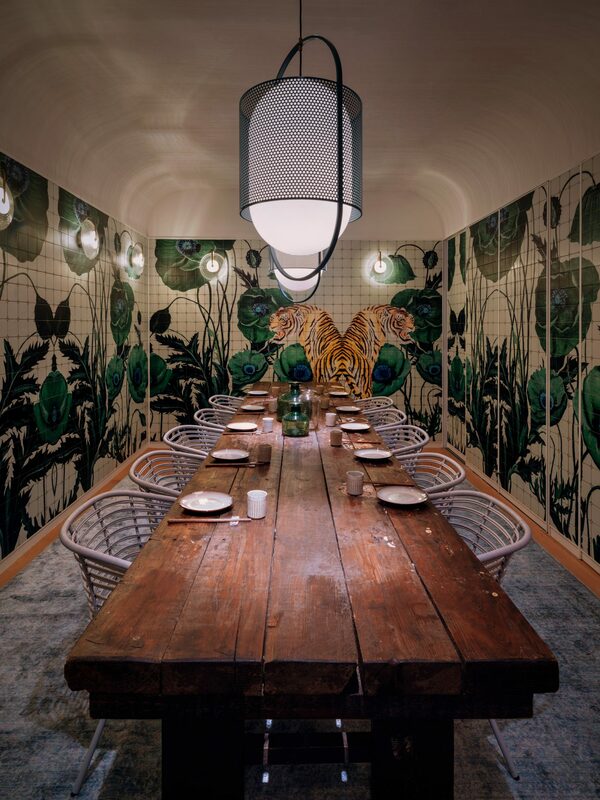 Throughout the restaurant, Linehouse explored the materials Anthony himself would have encountered on his journey: hand-glazed tiles, natural and racked renders, terracotta, hand-dyed fabrics and hand-woven wickers. John Anthony guests enter down a staircase made of white metal and back-lit with diffused glass. The entrance offers a hint of the interior's lime green terrazzo floor and triple-height arched ceiling, clad in pink tiles. The pink arches are reflected through the space in high-level mirrors. The main dining hall aims to reinterpret the storehouses of London's docklands with a vaulted ceiling. The floors of this main hall are paved with reclaimed terracotta tiles from abandoned houses in rural China. A collection of glass tubes containing gins infused with botanicals found along the spice routes hang above the bar. In the wall above the bar, arch-shaped enclaves display an expansive gin collection. A white metal structure, reminiscent of an industrial storehouse roof, hangs from the render ceiling with suspended custom timber tube lamps. In the dining area, hammered copper lights line the walls. 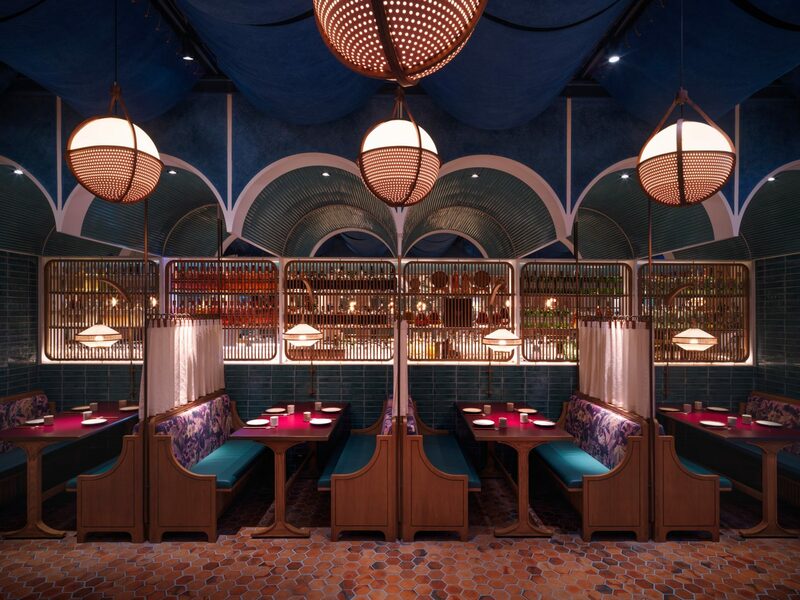 The fusion of Chinese canteen and colonial design is captured in the details of the timber bar with glass vitrines, wicker furniture, and gold and maroon floral fabrics. Beyond the main hall, a series of arched spaces allow for more intimate dining. The arches are clad in handmade green and blue tiles and frame views of the kitchen. Turquoise curtains can be drawn to create privacy from the main restaurant areas. "We had a local artist hand-paint these illustrations, which were then scanned and printed onto tiles by local suppliers. 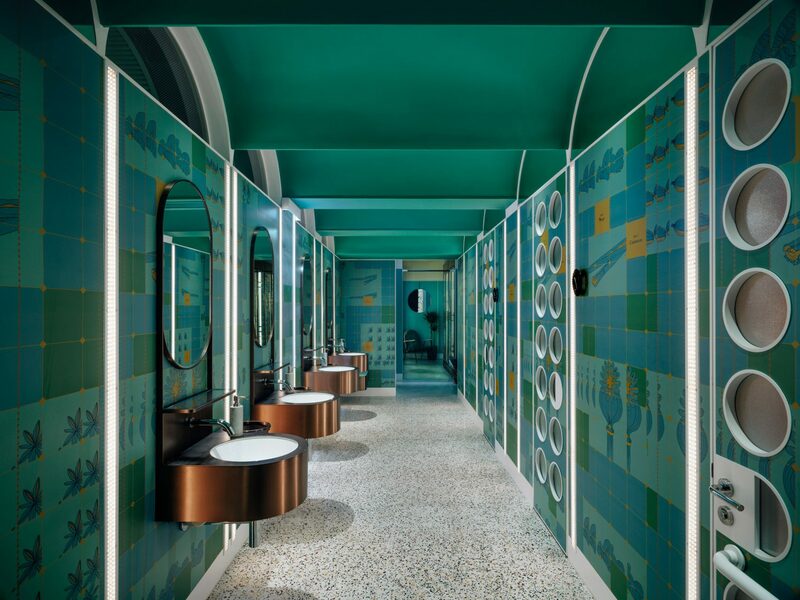 Every tile was different so it was a labour of love to have the final wall installed," Mok told Dezeen. Behind the bar a room features floral booths divided by cream linen curtains hanging from a copper rail. Hand-dyed indigo linen hangs from the ceiling to invoke nautical life. Custom copper mounted vanities are fitted above the basins and recycled plastic tubes line the ceiling of the bathroom stalls. Circular windows in the bathroom doors also reference the ships of the East India Company. "All the lighting for this project was custom designed in-house, working with local craftsmen," said Mok. "Most of the furniture was also custom-designed; the dining chair, all the tables, the rattan sofa are all locally produced." 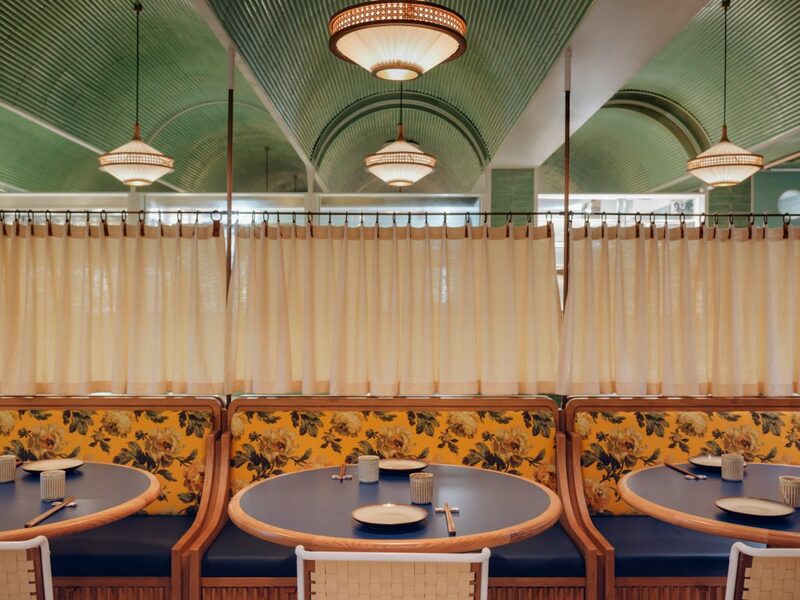 In Calgary, Canada, this dim sum restaurant and basement cocktail bar Two Penny Chinese by Canadian studio Sarah Ward Interiors looked to China's art-deco era for colours and motifs that would invoke 1920s Shanghai.